MASKerade: One Layer Wednesday 136 - A-ok! One Layer Wednesday 136 - A-ok! I'm hosting this week's One Layer Wednesday challenge. It is called A-ok. Here, I used the word Amazing (Papertrey Outline Alphabet)). I used an Asterisk. And I used the following colours: Ash, Apple, Amethyst, Azure, Amber, Avocado, Aubergine and Aqua. I think I deserve an "A" for this! lol! Now it's your turn! 2. Use something on your card that starts with A. An image, colour, word, technique or embellishment. Remember to keep embellishments to a minimum. 3. Post your card somewhere online and link to it using the InLinkz box on the sidebar of MASKerade. In your post, tell us what you've used in your card that starts with A (if it's not obvious!). If you link to your blog, please make sure it’s to the individual post and not your home page. 4. The most important rule of all: HAVE FUN! And if course your name is Ardyth for extra credit! That's a fun idea. I haven't played along in an age, but enjoy checking out the challenges every week. That is a whole lotta a's! Brilliant! ;) All of your cards deserve an A! You are amazing - at coming up with all these ideas. Where do you get them all from? I imagine all the hamsters (or 'amsters) running around in your head, but I bet they move in a very orderly fashion! And your card is definitely A-ok! Amazing Ardyth gets an A+! Oh, boy, you've given us a total challenge this time, Ardy (BTW, you forgot you get an A for your name, too!! ), since you aren't leaving a whole lot of As for the rest of us! Brilliant card, A++, as always! Gotta put on the thinking cap. I hope to play ... I've been sad to have missed so many OLWs!! Well this card gets an A* for clever creativity and you forgot one other A.... it was made by Ardyth!! Amazingly awesome, Ardyth. An actual artistic accomplishment. What a fun card and fun challenge. It reminds me of that old rhyme we used to say while we bounced a ball--a my name is ardyth and my husband's name is andy, we come from....you get the drift. Sheesh...I'm a bit pokey with my comment today and everything that I wanted to say has already been said! So, I will say ditto to absolutely every comment above. 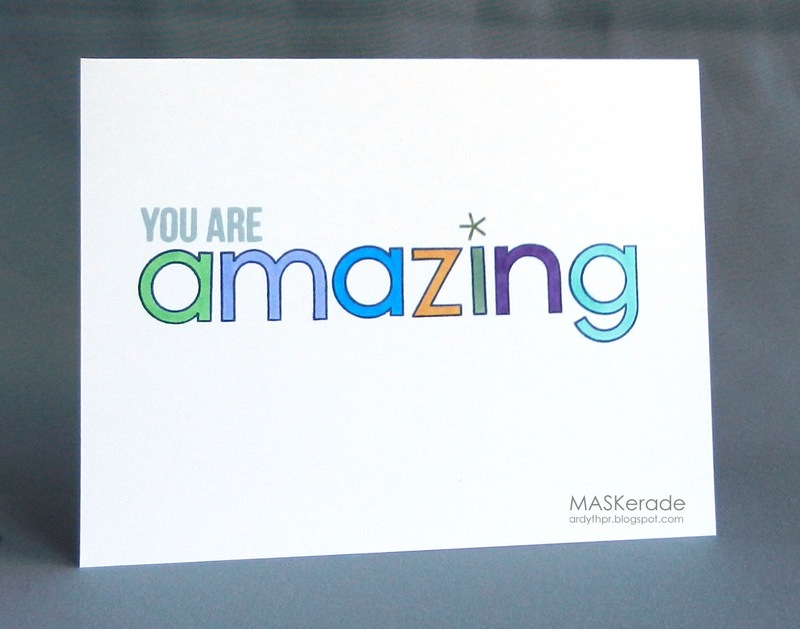 You really are A-mazing! What a clever way to use the "A" in so many ways...fabulous card, Ardyth! You definitely deserve an A+ for this one! Love the colours! I wouldn't have thought to go for the "A" colors too ... now that's going above and beyond! Isn't it fantastic how well they turned out together?! I only had four A colors, and made a hideous card with them, LOL! Yours is super fabulous. What a fun challenge, Ardyth!